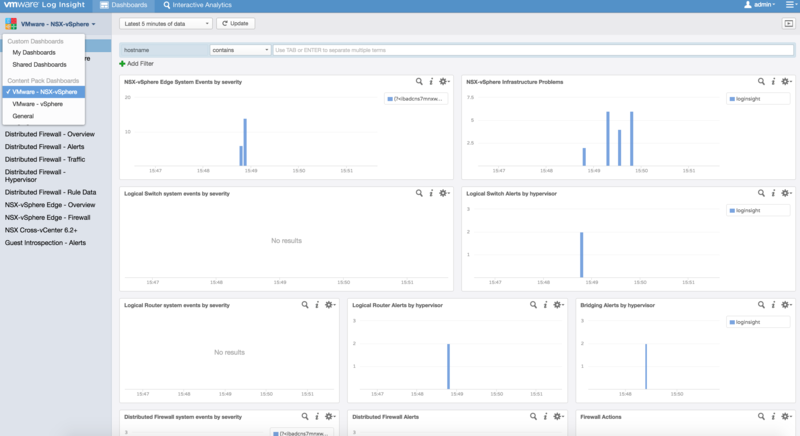 For every NSX license you purchase, you also get an OSI license for vRealize Log Insight! With that said, I wanted to show everyone how to deploy vRLI and redirect your logs for NSX managers, edges, controllers and ESXi to vRLI. 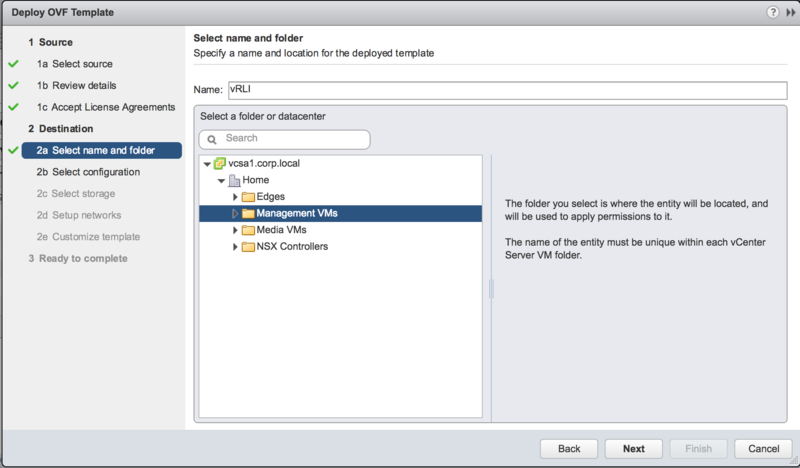 I will also show the configuration of the NSX content pack. If you haven’t heard of a content pack for vRLI, it is essentially a plugin that has pre-defined information about specific products using log analytics. The plugins are not limited to VMware products, you can define these plugins for Arista, HP, Cisco, Dell, Microsoft, Openstack, and much more. 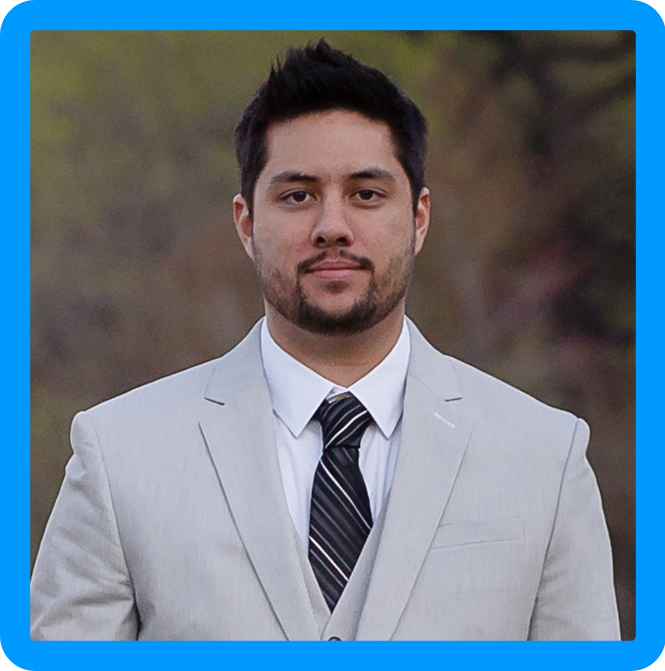 For a complete list of Content Packs, click here. 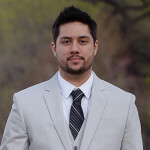 They include custom dashboards that allow administrators to quickly monitor analyze their infrastructure and determine if there are problems and how to fix them; or even just be proactive to determine future needs. If you would just like to try out vRLI, you can download a trial copy. 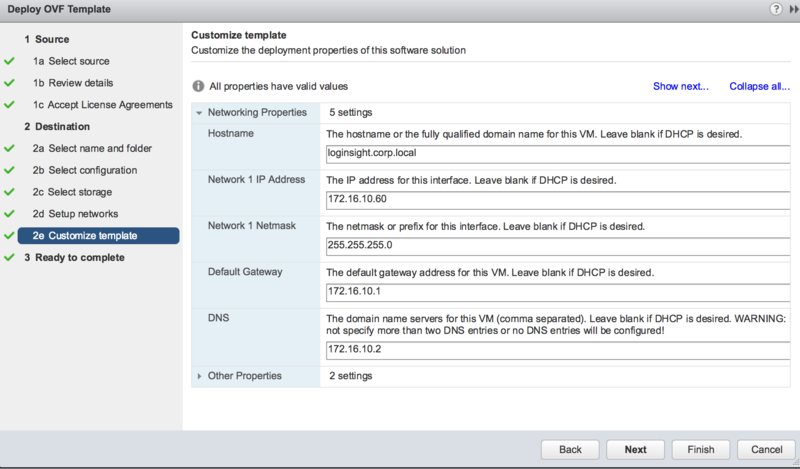 Log into the vSphere Web Client, right click on your cluster and click Deploy OVF template. 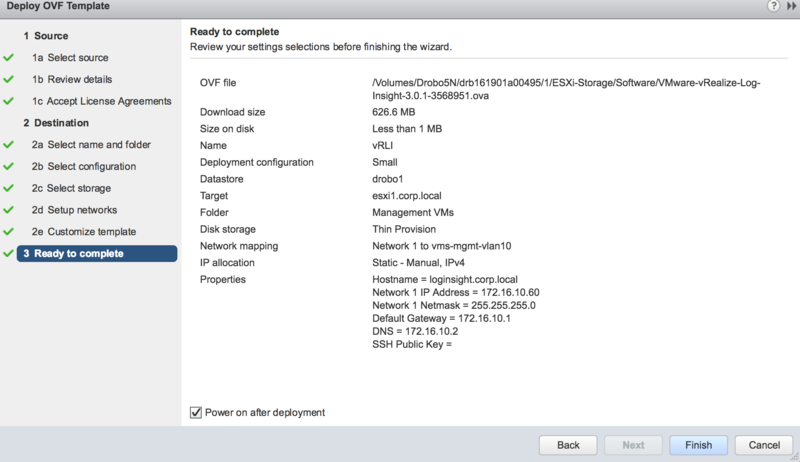 Select the vRealize OVA then click next. As always, read the entire EULA ☺, then select a name and a folder to place the virtual machine. Select the size of the deployment. I selected small (although I could have selected Extra Small since it’s a lab environment), but it wasn’t the default option and I already deployed the appliance. 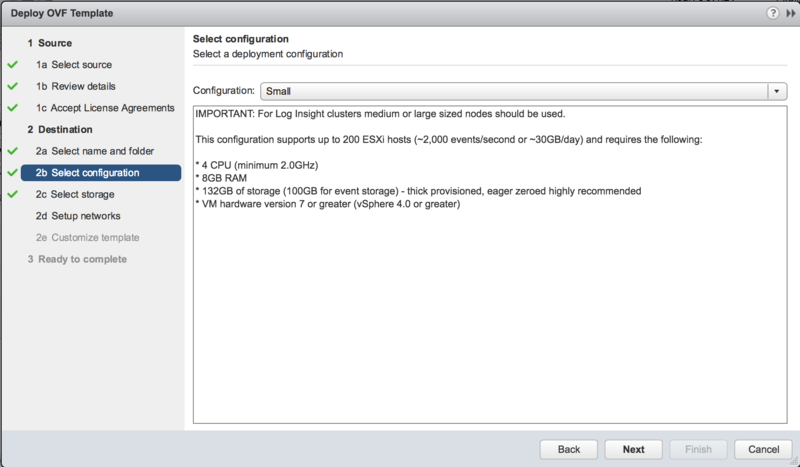 Extra small supports 20 ESXi hosts, small supports 200 ESXi hosts, medium is 500 ESXi hosts, and large is 1,500 ESXi hosts. Click next, then select the datastore you would like to put vRLI on. Select the appropriate port group, click Next, and then configure the networking settings for the appliance. Open a console to the appliance, and wait until you see the following screen. Mine took about 5-10 minutes after the virtual machine was powered on. 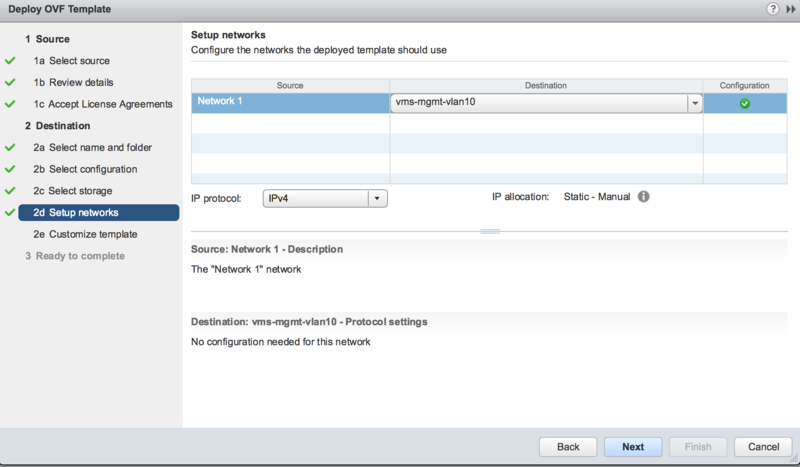 Once you see the screen below, open a browser and point to the IP address or FQDN to configure vRLI for the first time. Configure NTP. 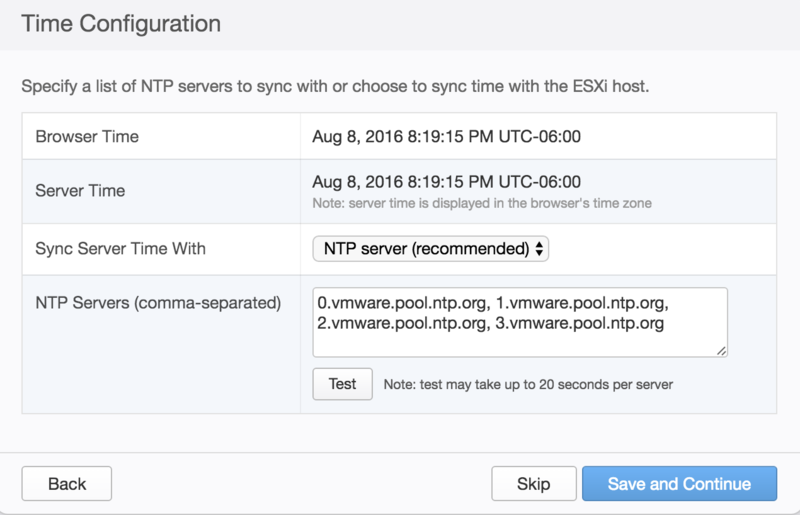 By default it will point to vmware NTP pool servers, or you can point to your own NTP pools. 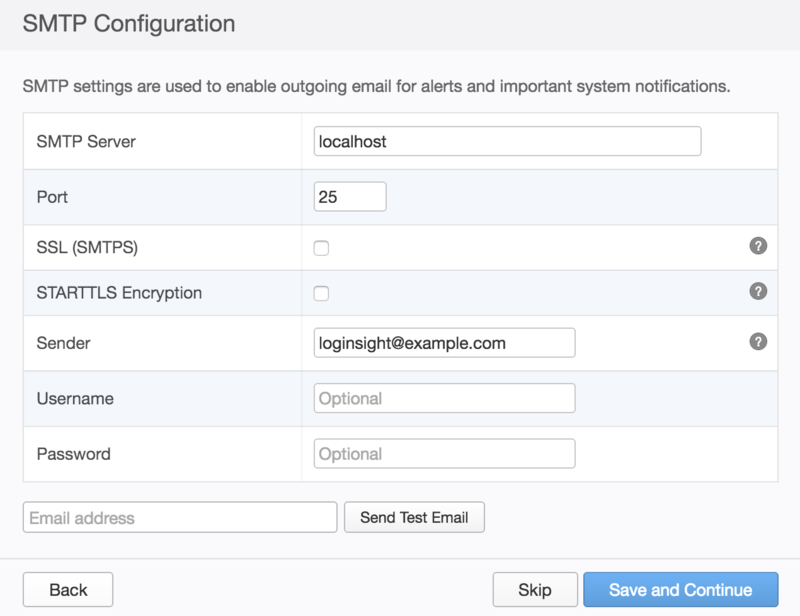 Configure SMTP, or skip, then click Save and Continue. Click Finish and you are done with the initial configuration and can start using vRLI! The next steps will outline how to add your vCenter Server and ESXi hosts, as well as how to redirect NSX logs to the vRLI appliance. To add your vCenter Server, or multiple vCenter Servers, Click the box on the top right, then click Administration. 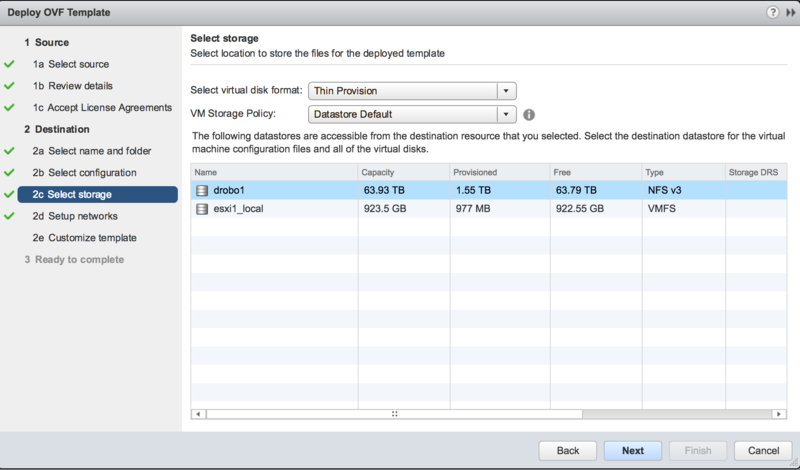 Fill out the vCenter Server FQDN and password, and configure your ESXi hosts at the same time. Next, click that same box at the top right, and then content packs. 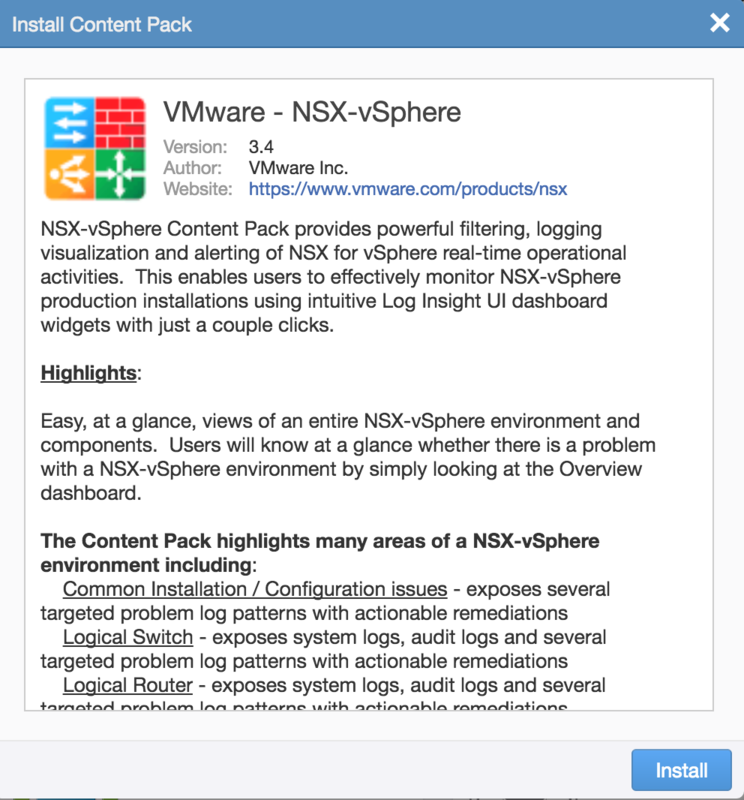 Find “VMware – NSX-vSphere” and click it. Then click Install. 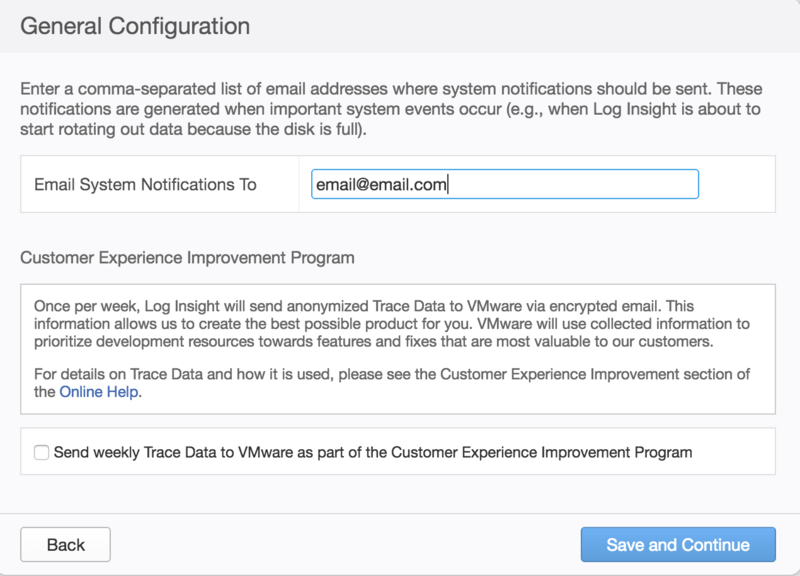 It will remind you to forward logs for ESXi, NSX Manager, Controllers, and edges. If you are unsure on how to accomplish this, please see the following links and or configuration snapshots. The controller syslog configuration takes the most work, if you like pictures, like me, here is the API call. That’s it! 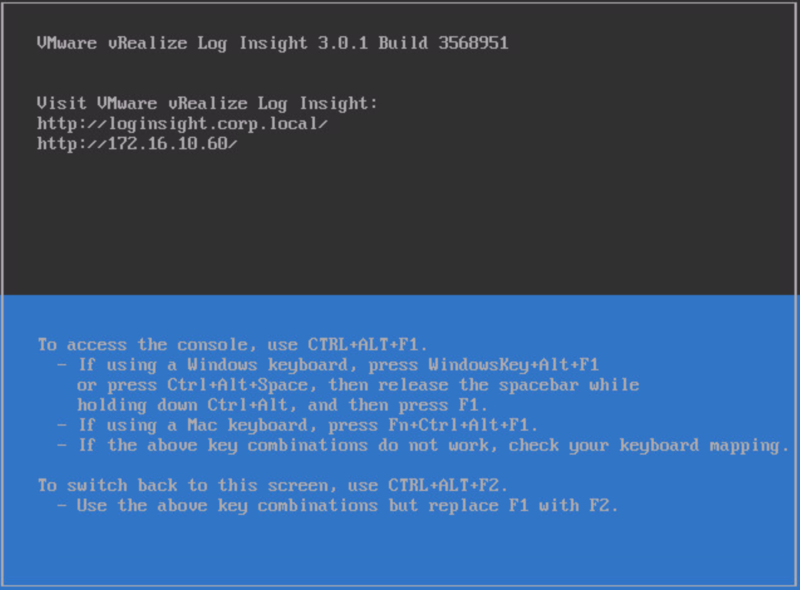 vRealize Log Insight and the NSX content pack are all set up! My Dashboard is pretty boring right now since I just set up my lab. 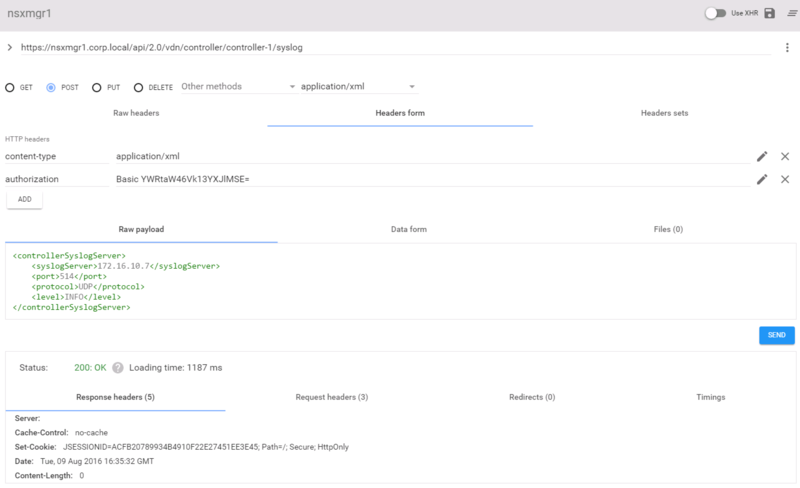 Once I get some workloads and more activity, I will write another post on some of the things you can do with vRLI to help with troubleshooting, monitoring, and more. If there is something specific anyone would like to see, please comment in the posts below and I will do my best to include it in the next post!